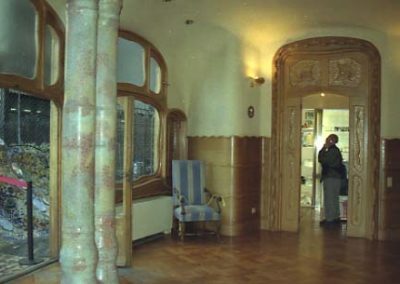 Visits and timing: Private owned building you can visit Mondays to Sundays from 9 to 20 h. (the timing may be changed following the availability of lounges). 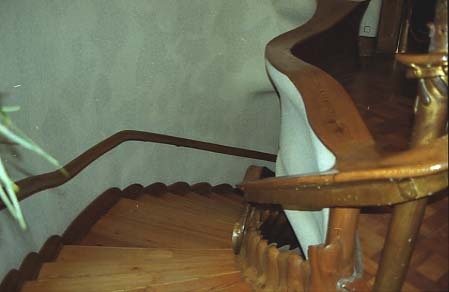 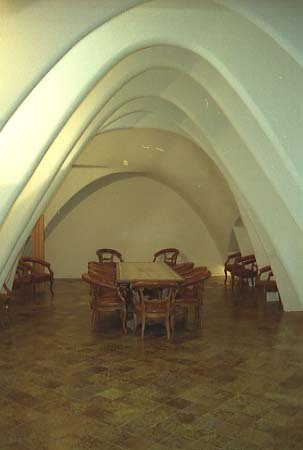 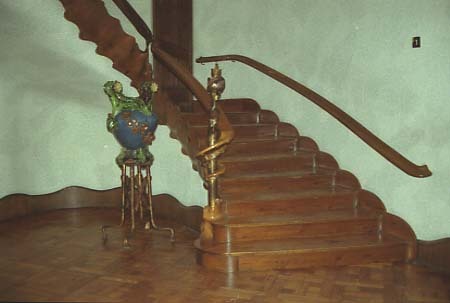 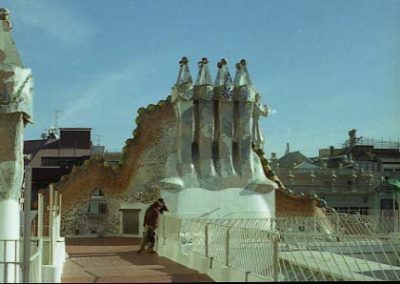 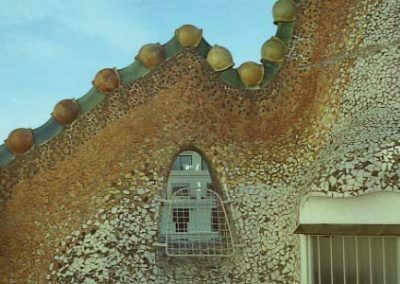 It is possible to visit the ground and first floors (former residence of Batlló family), the loft and the roof. 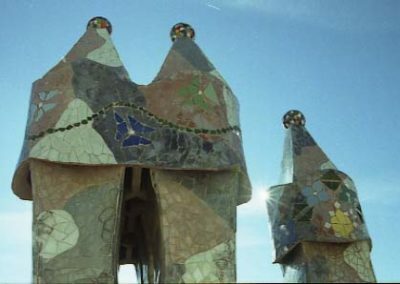 Timetables, prices and other information may change, it is advised to check beforehand. 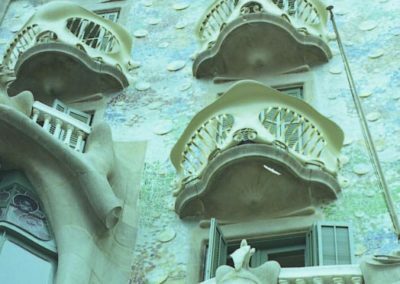 • The price includes an audio guide in 8 different languages- (English, German, French, Italian, Spanish, Catalan, Japanese and Chinese). 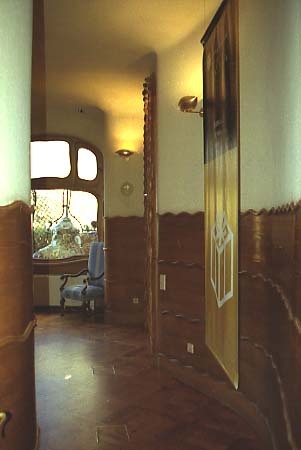 • Complete visit: Individual: 16’50 Euros. • For visitors through Minicard and Barcelona Libraries it is a discount of 15% on individual fees. 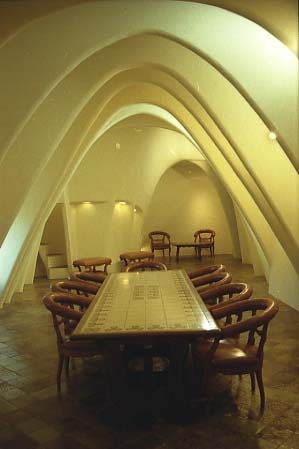 • For visitors through Minicard it is a discount of 10% on individual fees. 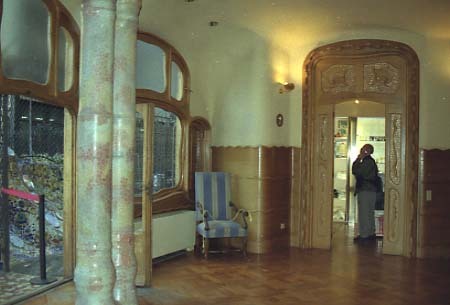 Available guidebooks: It is possible to buy in the same building a guide on Casa Batlló edited by Triangle Postals and titled “Casa Batlló-Gaudí”, text in English, French, Spanish and Catalan by Juan José Lahuerta and photos of Pere Vivas and Ricard Pla – including a CD -, and also some other books and gifts on the house. Handicapped accessibility: All the ground floor does not have unevenness and it is at the same street level. 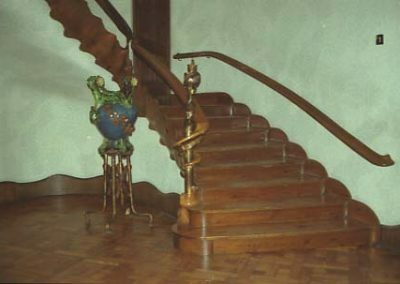 To visit the 1rst. 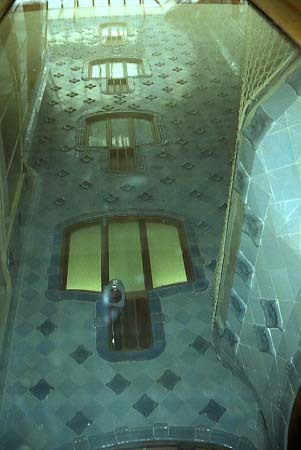 floor it is a lift assuring the accessibility for wheelchairs. 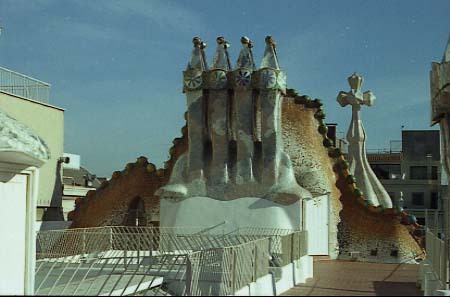 The uper lofts are also accessible by lift, but the roof and other outbuildings at the same level aren’t. 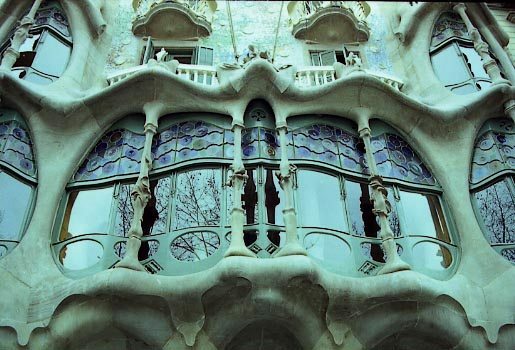 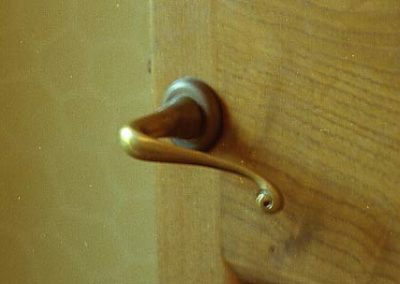 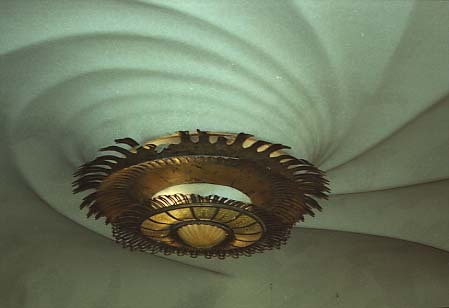 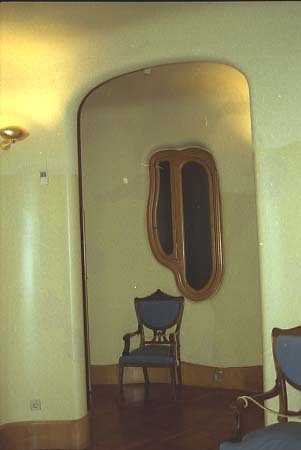 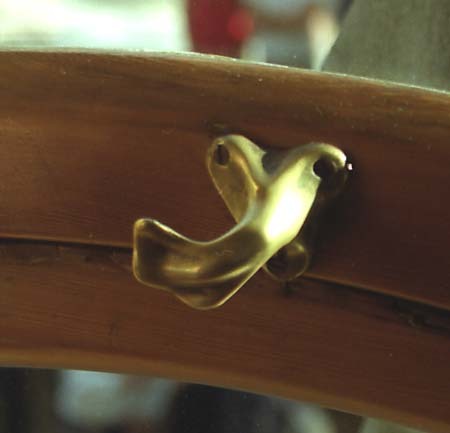 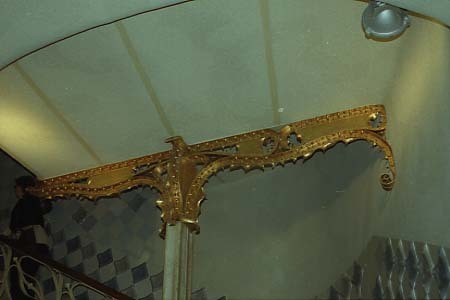 The present Casa Batlló, is the result of a total refurbishment of an old previous conventional house built in 1877. 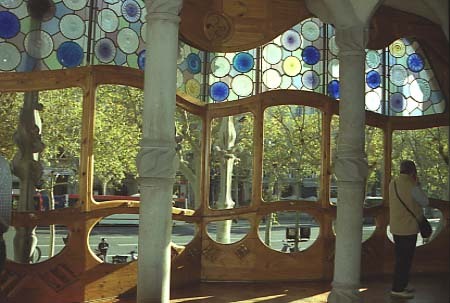 Gaudí was commissioned by the owner Josep Batlló i Casanovas to totally renew the old building. 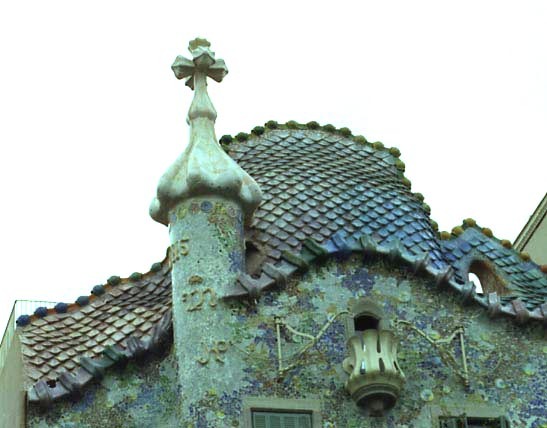 On that base, Gaudí projected this astonishing house, one of the most fancy and “special” of Barcelona. 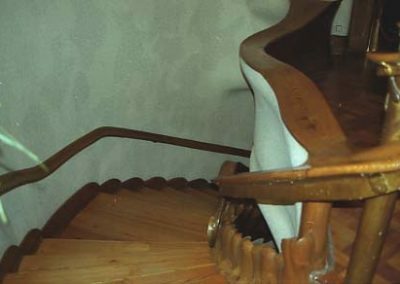 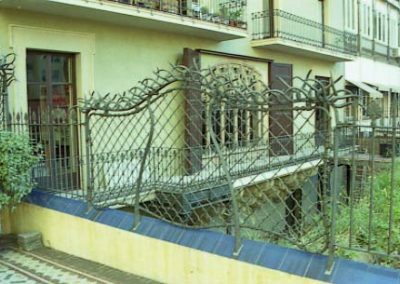 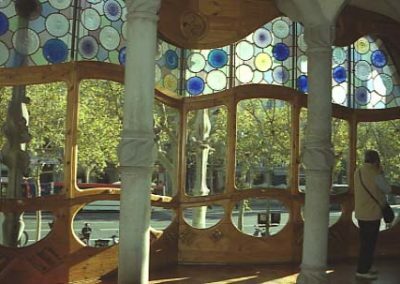 The project of the architect Antoni Gaudí i Cornet of 1904 was strongly discussed by municipal authorities due to a lot of elements of the design of Gaudí over the bylaws standards. 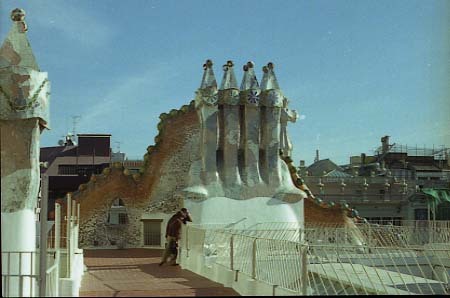 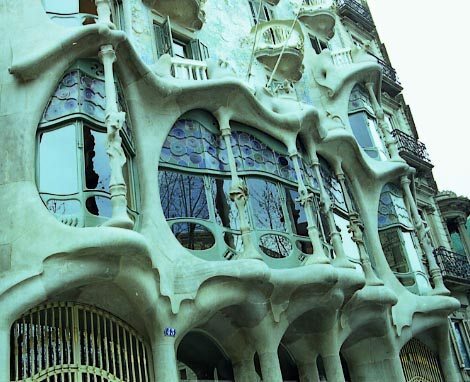 The changes made by Gaudí on the old building were radical and affect all the building. 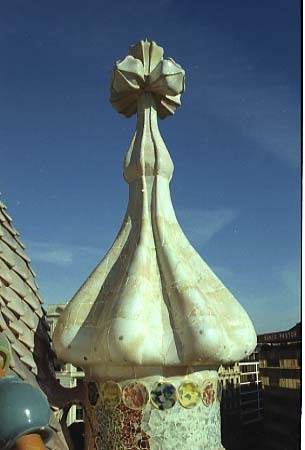 In fact the building of Gaudí is a new building. 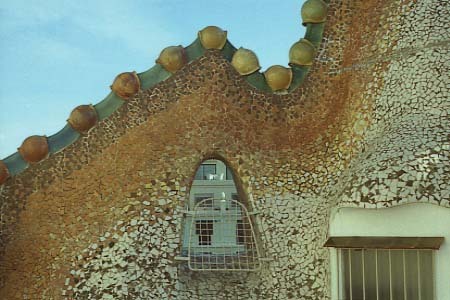 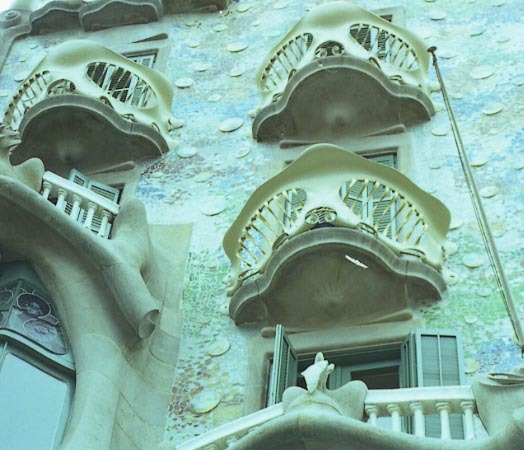 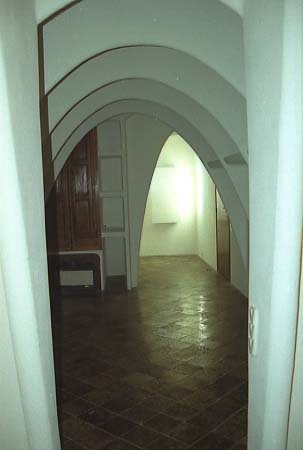 Gaudí added a gallery, the balconies and the polychrome ceramics. 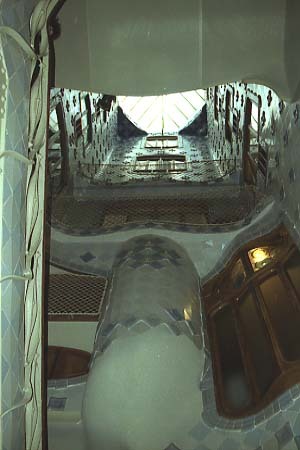 Inside, the spaces were totally reorganized in order to obtain in it more natural light (the courtyard is covered with blue ceramic progressively brighten to assure the same or similar light on top and on ground) and ventilation. 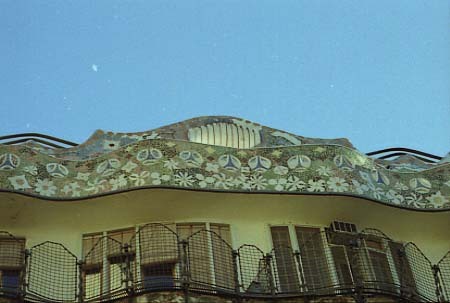 Gaudí also added two floors to the building. 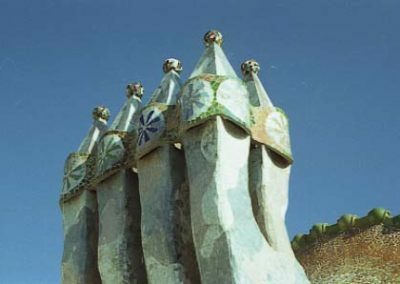 Outside, Gaudí carried out one of the most impressive and brilliant urban façades of the world. 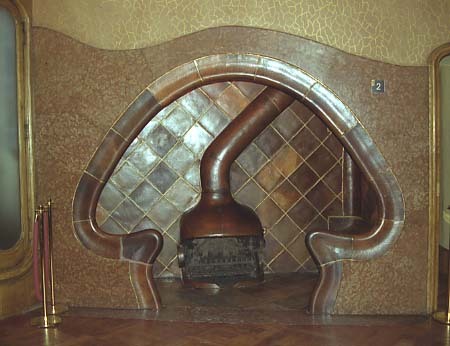 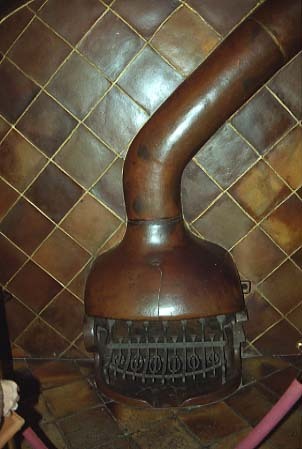 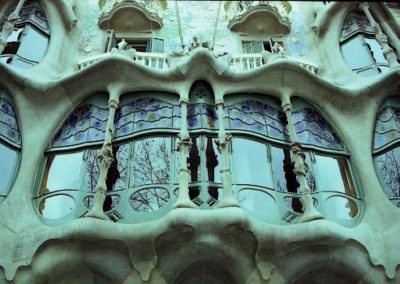 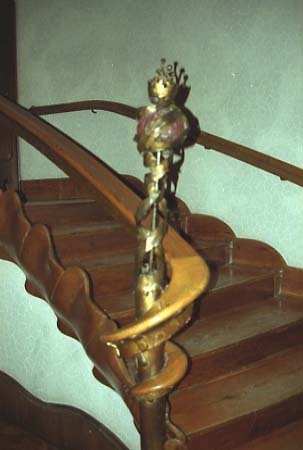 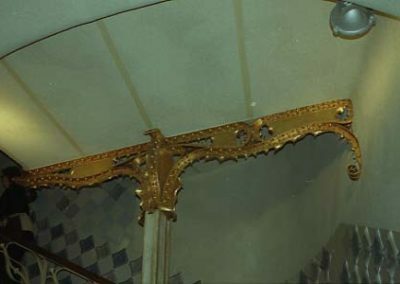 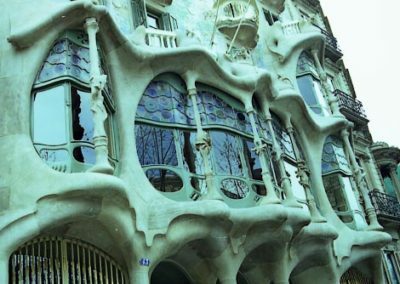 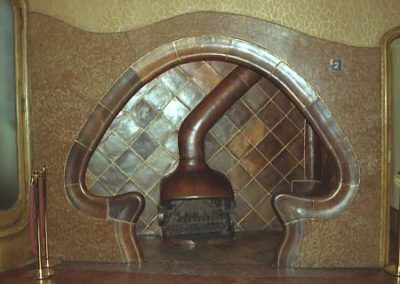 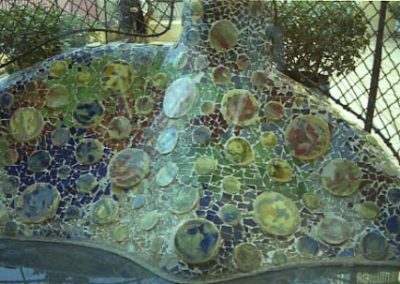 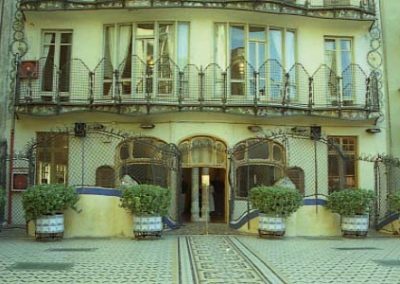 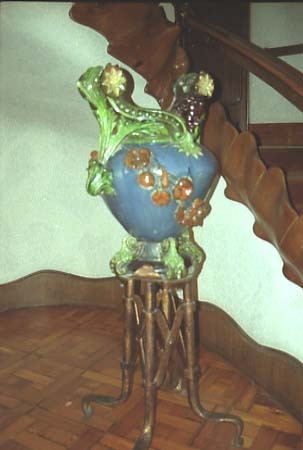 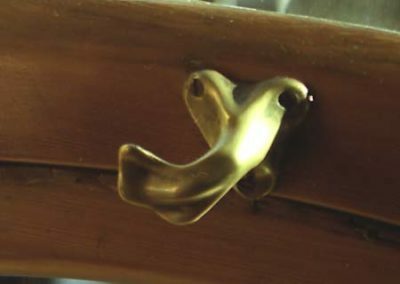 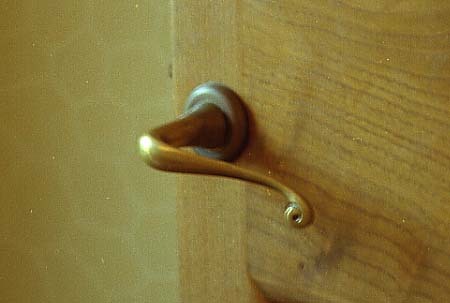 He used for it the typical constructive elements of the Modernisme (Catalan Art Nouveau) as the ceramics, the stone and the iron forged. 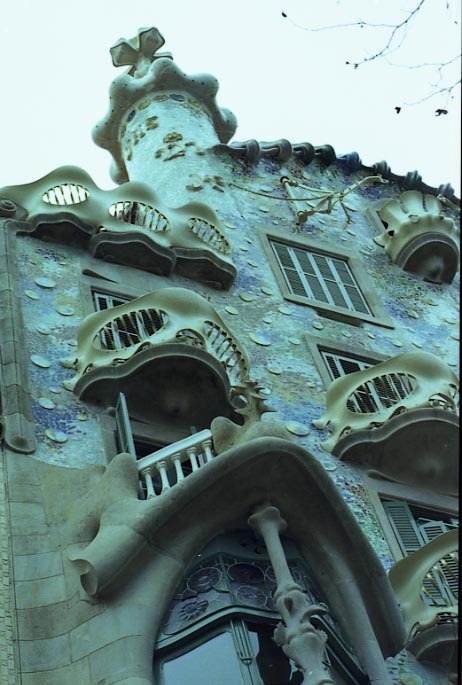 The facade is impressive so much if is contemplated during the day as during the night, under a special lighting. 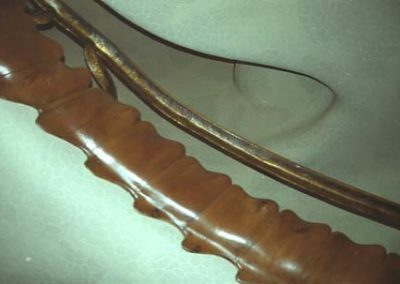 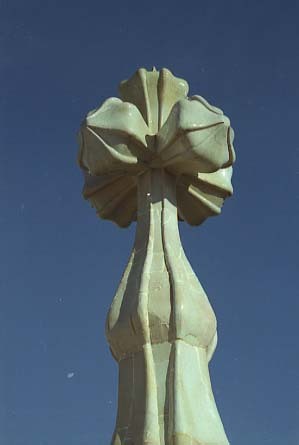 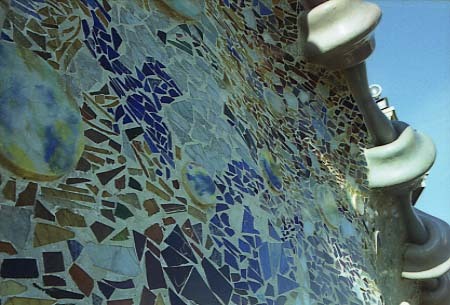 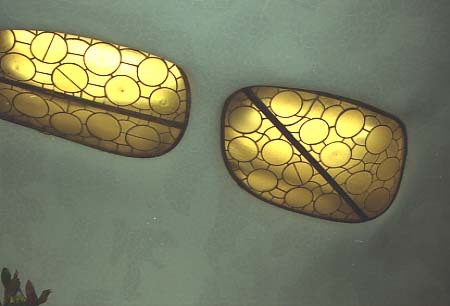 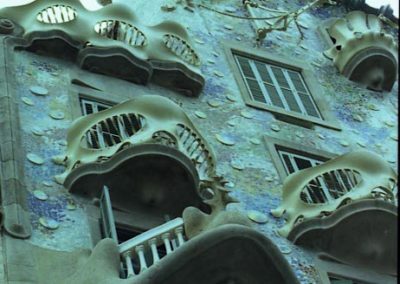 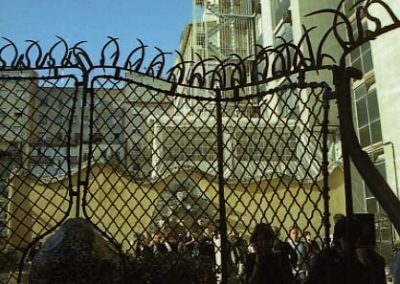 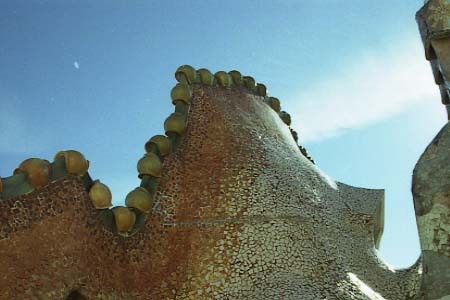 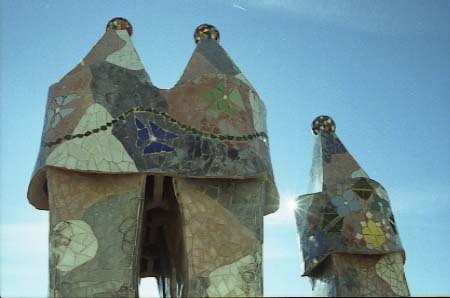 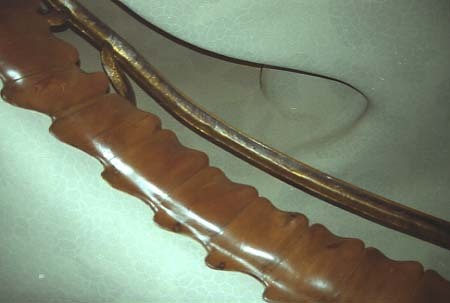 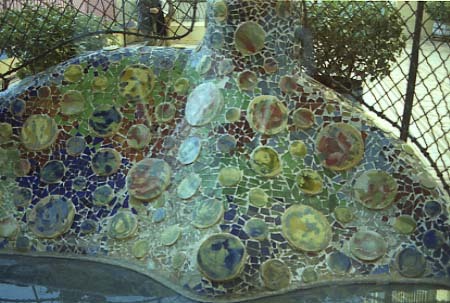 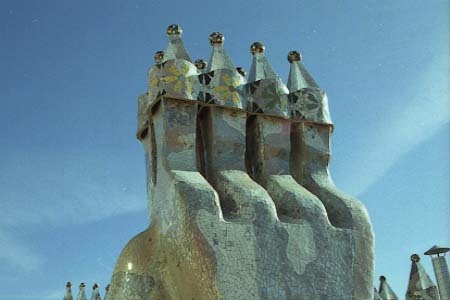 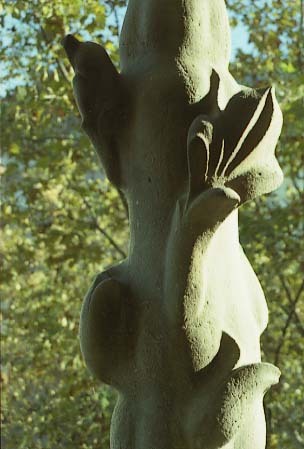 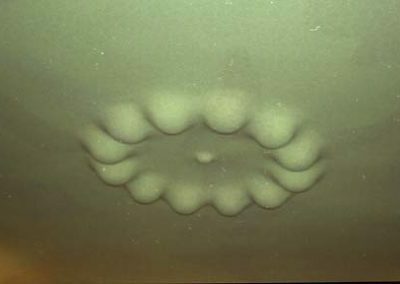 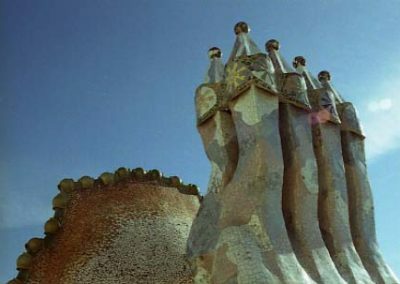 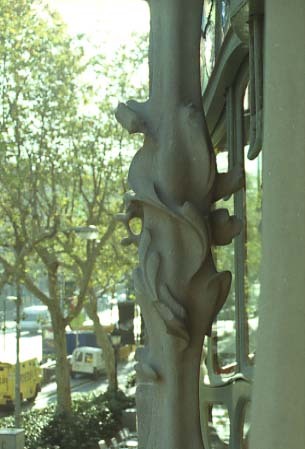 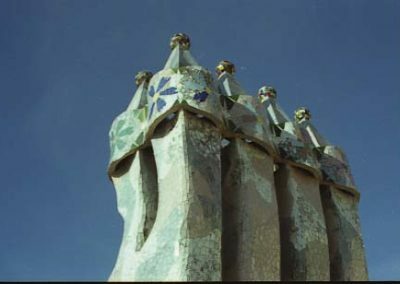 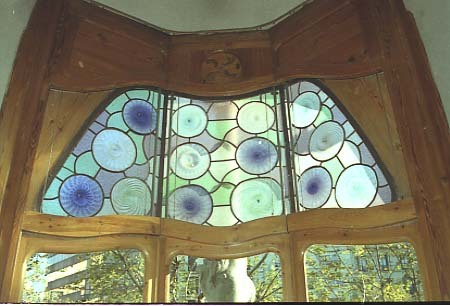 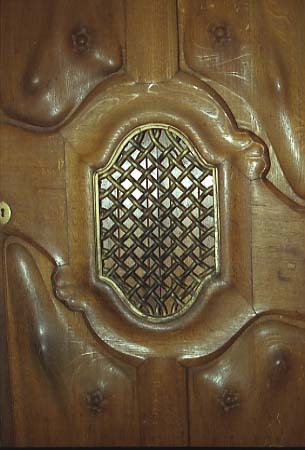 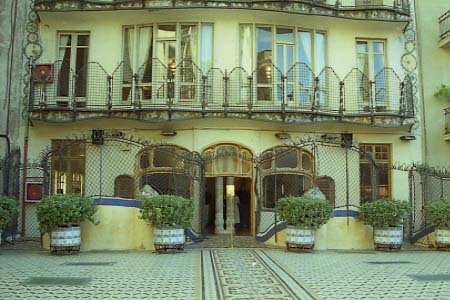 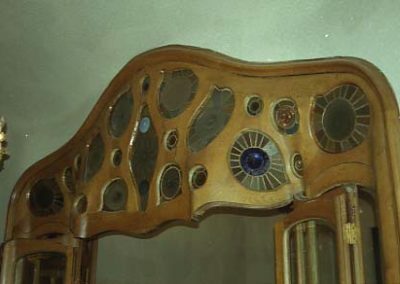 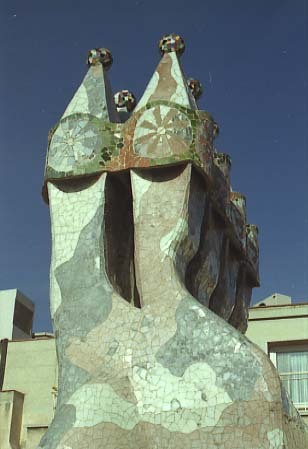 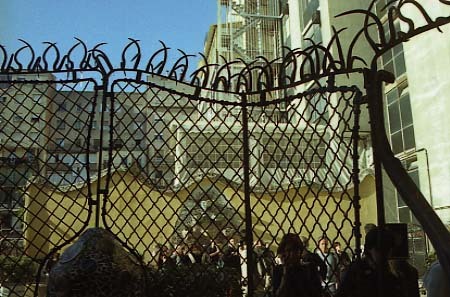 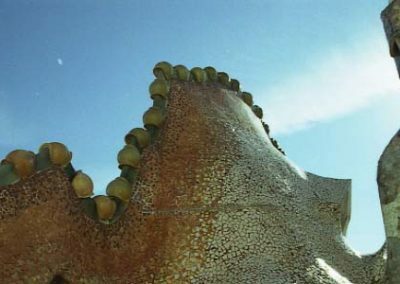 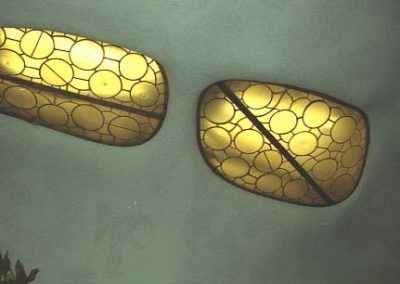 A lot of prestigious artists had been working in it under Gaudí instructions (following Permanyer), specially: the architects Josep Maria Jujol and Joan Rubió i Bellver on façade, the brothers Badia in iron, the carpenters Casas i Bardes, Sebastià Ribó made the ceramics and the Tallers Pelegrí the glass cases – see Gaudí collaborators -. 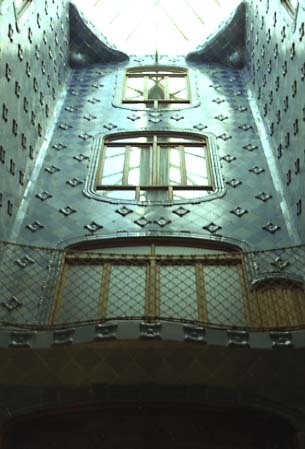 Awarded as one of the three best buildings of the year 1906 by the Barcelona city Council. 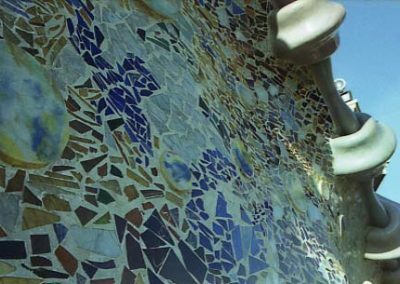 The façade covered by mosaics of splendid colors is perhaps the most suggestive, creative and original of the city of Barcelona. 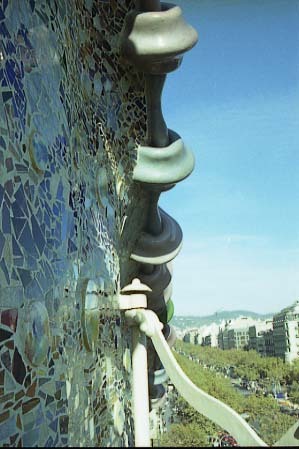 The balconies remember pieces of skulls with its eyes and mouth. 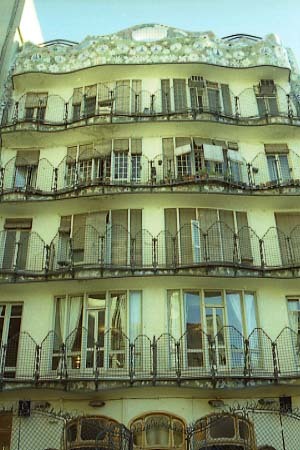 The columns of first floor look like human bones. 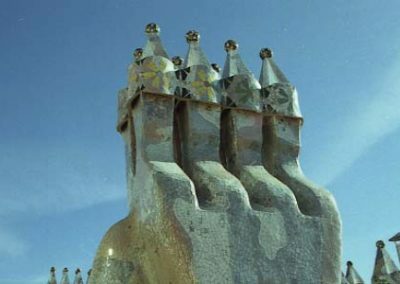 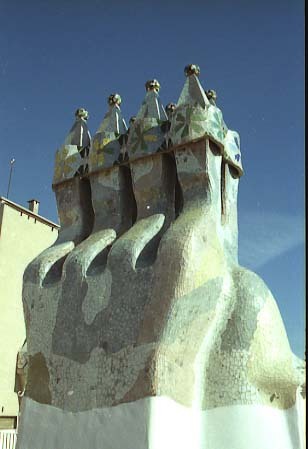 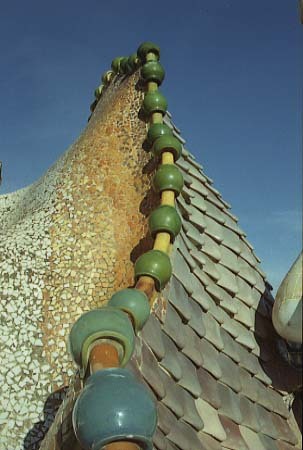 The roof decorated with polychrome ceramics of brilliant colors is crowned by a tower with the typical Gaudí four branches cross. 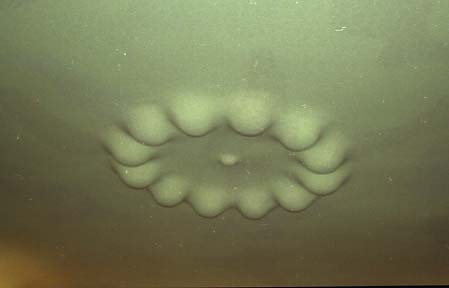 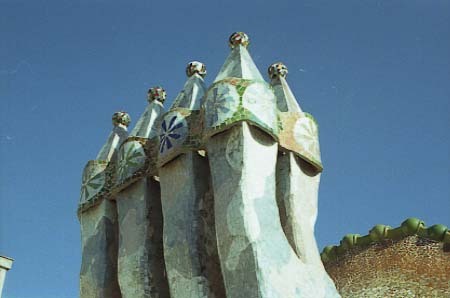 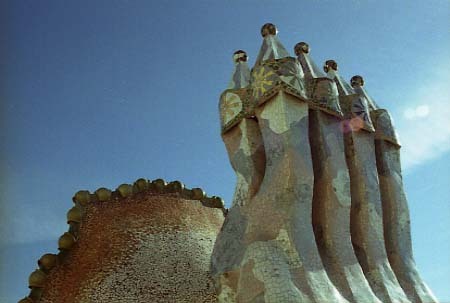 The design of that roof is one of the most characteristics of Gaudí for urban buildings. 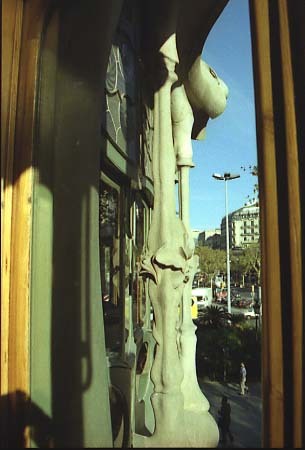 The incredible imagination it shows, remember La Pedrera, located in the same avenue. 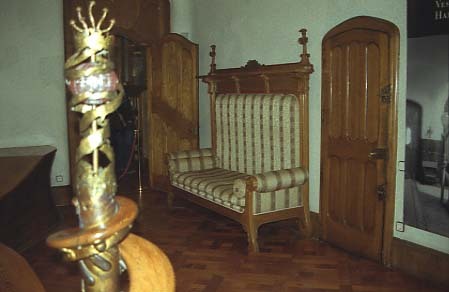 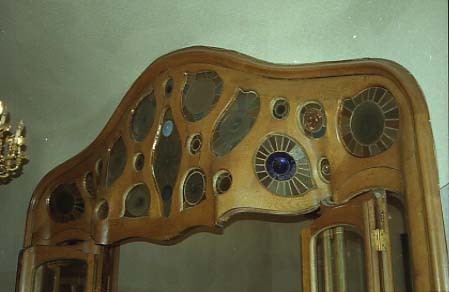 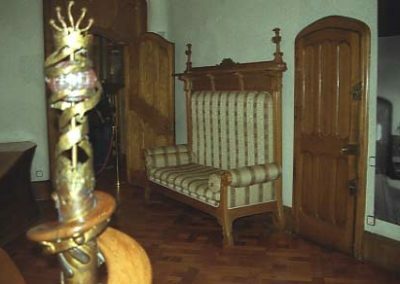 The interior is also very impressive showing various decorative elements as furniture, glasses, forged iron elements, fireplaces, etc. 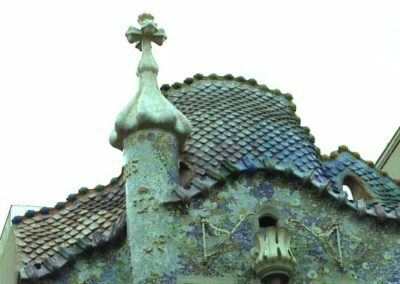 Gaudí put a special attention on the first floor, the design of the roofs is very brilliant and the decoration show a big originality. 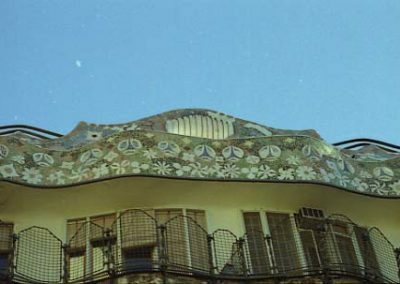 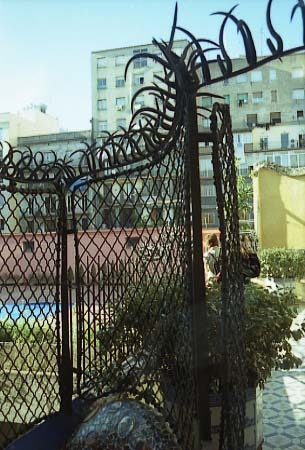 Architects Jujol and Rubió participated in the decoration, being the Canaleta and Sugrañes works oriented to the structure. 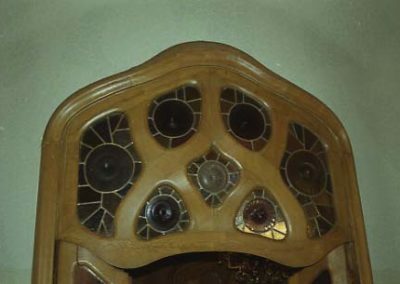 About sculptors work, it was basicaly devoted to the chapel of the house, essentially the one of Llimona, author of the magnicent images of the altarpiece.